Unitarian Universalism was not always like it is today—in fact, if you look and listen carefully, you will find changes happening around you even in the present. The text of a pamphlet on UU history can be found on the UUA website. Test yourself with a UU History Mix and Match! The answers can be found here. Read a book, chapter, article, website, or pamphlet on the history of Unitarian Universalism. Write down any questions you may have, and continue to Look Up and Record the meanings of words that are unfamiliar. Talk with your advisor about this history. Consider how its history has made Unitarian Universalism what it is today. Create a Skit summarizing this history to someone learning about Unitarian Universalism for the first time. Revisit the UU Principles and Sources. Find Out how they were developed, when the statement was first officially adopted by the Unitarian Universalist Association (UUA), and how it has changed since then. What statements did Unitarian Universalists have before this statement? Find earlier Unitarian, Universalist, or Unitarian Universalist statements of belief (consider those of these three denominational organizations and/or those used in your own congregation). Do you agree with all, some, or parts of the statements from long ago? How could the changes in the statements relate to other changes in Unitarian Universalism or in American culture? How do they relate to the process of becoming more inclusive? Which do you think changes first—the words, the people, or the ideas? Record your thoughts and research in your journal, portfolio, or computer folder. 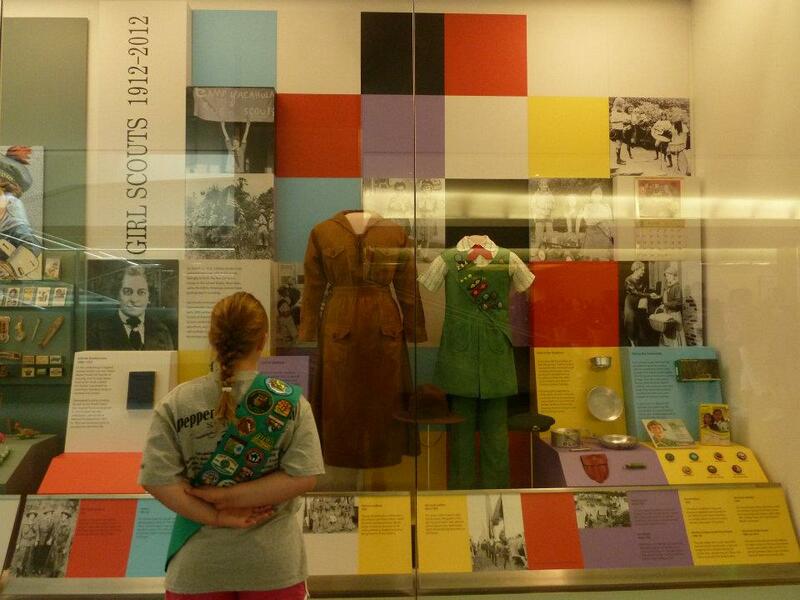 A girl scout learning about Girl Scout history throughout the decades. The Tapestry of Faith program Faith Like a River includes a “History of Statements of Belief.” A “Collection of Covenants and Statements of Belief” that accompanies the history page can be found here. Click here for Girl Scout Link C.
You have probably already noticed that a lot of people do not know who UUs are—as a group, at least. However, we have had more than our fair share of famous thinkers, leaders, reformers, artists, scientists, and others who have changed the world we live in. You have probably already studied several famous UUs, perhaps not knowing they share your religious heritage. Visit the Dictionary of Unitarian and Universalist Biography and Famous UUs and peruse the list of names. How many of the names do you recognize? Choose at least 3 people and Read their entries on the sites. Find Out what they thought and did, and how they affected our world. How do their contributions relate to our religion? Do you have a belief that is so strong that, for its sake, you could brave the sort of persecution or ridicule some famous UUs experienced? To what extent are you protected from such treatment in your community today? Are there other places or times in which stating the beliefs you hold now would be more risky? Have you experienced lesser forms of criticism or other negative consequences for your beliefs? Are there situations where it makes more sense to keep your beliefs private or express them in a way that is “safer”? When you choose to speak out, how do you find the courage? Create a work of art, a poem, a song, a video, an essay, a blog post or some other way of expressing your responses.